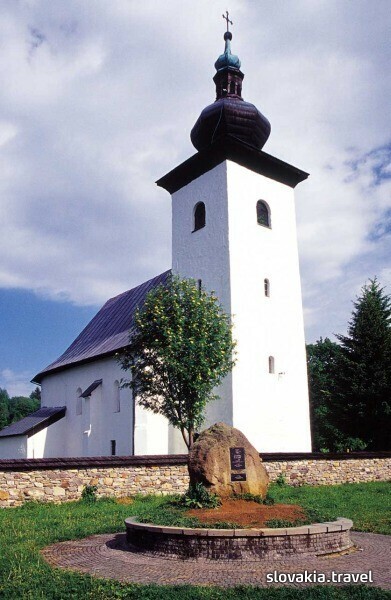 The Slovak geographical centre of Europe is situated in Kremnické Vrchy mountain range. It lies off the main road from Kremnica to Martin, next to the gothic Church of John Baptist. The important geographical point is marked by a small monument next to the defence wall of the church. The monument has the shape of a big oval stone reminding the rugby ball erected upwards. The foundation stone of the Slovak state was also laid here on the occasion of establishment of the Slovak Republic. A new element is the memorial of the Slovak Centre of European Integration standing on a meadow. The Centre of Europe is easily accessible by car.